The Diamondback Terrapin (Malaclemys terrapin) is often described as the most beautiful turtle in the Western Hemisphere, if not the world. It is also distinguished by being the only turtle adapted to life in estuaries, salt marshes and other brackish habitats (water that is neither fresh nor marine). Long considered a delicate pet, the needs of this spectacular animal are now well-understood, and captive-bred specimens are increasingly available. My first Diamondback, received in childhood, was a hatchling. That ill-fated creature was quickly consumed by a Blue-Claw Crab (long story! ), but later experiences with this species in the wild, at home and in zoos has (hopefully!) enlightened me as to their proper care. We still have much to learn, however, so please post your own observations below. The Diamondback Terrapin varies greatly throughout its range, but is always breathtaking. The carapace, marked with deep concentric grooves and ridges, is unique in the turtle world. Other shell markings vary, with the most eye-catching being born by the aptly-named Ornate Diamondback (M. t. macrospilota) of Florida. The skin is also unusually-attractive, ranging from pearl-gray to black in color, and decorated with dark flecks and slashes. Males average 5-6 inches in length, while females may approach 10 inches. Although the Diamondback Terrapin is a habitat specialist, its range is among the largest of any US turtle. Seven subspecies are found along the Eastern and Gulf coasts of the USA, from Cape Cod, Massachusetts through the Florida Keys and along most of Texas’ eastern coast (to the vicinity of Corpus Christi). An isolated population lives along Bermuda’s coastline. Diamondbacks are found only in those habitats that straddle the line between fresh and salt water – coastal salt marshes, estuaries, tidal flats near river mouths and protected lagoons. Highly aquatic, they often bask by floating at the water’s surface. Some populations also spend varying amounts of time in purely-marine water. Tidal creeks spanned by footbridges are great places to observe wild Diamondbacks. If unmolested, they will forage and bask without regard for prying eyes. I know of several sites on Long Island, NY where, due to the height of the footbridges, I can sometimes see terrapins picking snails and other invertebrates from bridge pilings. Populations have been decimated by collection for the food trade and habitat loss, and many perish as “by-catch” in commercial crab traps. These unique turtles are protected throughout their range, but regulated commercial harvesting is permitted. Even by aquatic turtle standards, Diamondback Terrapins are extremely active. While a 75 gallon aquarium might suit a male, females need tanks of at least 100 gallon capacity, commercial turtle tubs or ponds. A dry basking surface is essential. Commercial turtle docks and ramps suffice for smaller specimens, but adults will likely sink anything that is not affixed to the glass with silicone adhesive. Cork bark wedged between the aquarium’s sides is another option. While individuals from some populations have adapted to fresh water in captivity, keeping them so is not recommended. Fungal and bacterial skin infections are commonly seen when Diamondbacks are denied access to salt water, and internal ailments may develop as well. Marine salt marketed for aquarium fish should be used to raise salinity to 1.014-1.018. Water evaporation will cause the salinity to increase (salt does not evaporate), so be sure to take weekly readings with an aquarium hydrometer. Diamondback Terrapins remove some salt from the water they ingest, but should also be placed in fresh water 1-2 x weekly and allowed to drink for 10-20 minutes. Some keepers do fine with less-frequent fresh water immersion, and by using rock salt instead of aquarium salt, but I prefer to err on the side of caution. Water quality is extremely important…more so than for most other turtles. Fouled water invariably leads to skin infections. As Diamondbacks are adapted to the alkaline water habitats, it is advisable to check your aquarium’s pH regularly with a simple test kit or pH strip. Turtle wastes and uneaten food will cause the water to become acidic, which will leave your pets open to attack by various fungi and bacteria. Turtles are messy feeders and very hard on water quality. Unless the enclosure can be emptied and cleaned several times weekly, a powerful submersible turtle filter or canister filter will be necessary. 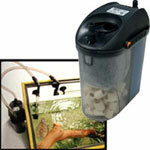 Even with filtration, partial water changes are essential. Please see the articles under “Further Reading” for more on filtration, and links to useful models. Removing your turtles to an easily-cleaned container for feeding will lessen the filter’s workload and help to keep the water clean; please see the article linked below. 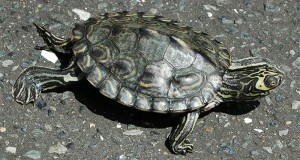 Diamondback Terrapins are best kept in bare-bottomed aquariums. Gravel traps wastes, which greatly complicates cleaning. A source of UVB radiation is essential. If a florescent bulb is used (the Zoo Med 10.0 UVB Bulb is ideal), be sure that the turtle can bask within 6-12 inches of it. Mercury vapor bulbs broadcast UVB over greater distances, and also provide beneficial UVA radiation. Water temperatures of 70 – 76 F should be maintained. These large, robust brutes often break typical aquarium heaters, so choose a “turtle-proof” model. An incandescent bulb may be employed to heat the basking site to 85-90 F.
The Diamondback Terrapin’s broad, crushing jaw surfaces are an adaptation to a diet comprised largely of hard-shelled crustaceans and mollusks such as crabs, snails, clams, mussels, barnacles and shrimp; fish, marine worms and algae (seaweed) are also taken. Pets should be offered a diet based upon whole marine animals such smelts, shiners and other bait fish, prawn, crabs (i.e. bait crabs), squid, conch, periwinkles (available in many seafood stores) and similar foods. I occasionally use bags of mixed “chowder” seafood as a means of adding variety to the diet. Collecting Diamondback Terrapin food brings one into contact with countless fascinating creatures, so I try to gather or trap snails, mussels, clams, spider crabs and fishes for my charges whenever possible. Most individuals will also accept commercial turtle pellets and trout chow, which can comprise 40-50% of the diet. 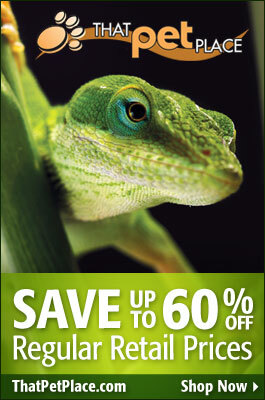 I favor Zoo Med’s products and Reptomin. Without sufficient exercise, your terrapin’s jaws will quickly become over-grown. Shells, exoskeletons and bones also supply calcium, which is needed in great quantities by this dietary specialist. A cuttlebone or turtle mineral block should be available as a calcium supplement and to supply beak-trimming exercise. Gravid (egg-bearing) females usually become restless and may refuse food. They should be removed to a large container (i.e. 5x the length and width of the turtle) provisioned with 6-8 inches of slightly moist soil and sand. Gravid females that do not nest should be seen by a veterinarian as egg retention invariably leads to a fatal infection (egg peritonitis). It is important to note that females may develop eggs even if un-mated, and that pets may produce several clutches each year. The 4-20 eggs may be incubated in moist vermiculite at 80-82 F for 55-65 days. Diamondback Terrapins make very responsive pets. Most feed readily from the hand, and adapt well to busy households. 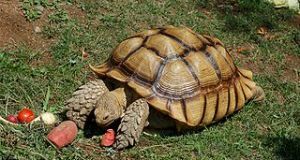 However, all turtles are capable of administering powerful bites and scratches when frightened, and must be handled with care…this is especially true of a large species that can crush snail and clam shells! Hello, I have a sick guy on my hands and not sure of what to do next. He is approximately 11 years old and co-habitats with an older Terrapin age 17 years Little Dude is the smaller sick one. Herbbie is the older healthy one Little Dude started behaving less like his usual self about a week ago and has lost a significant amount if weight He seems to have lost his equilibrium to a degree and is not eating.I have isolated him from Herbie. He is now in a smaller manageable container that I have in my bathroom tub fir now. I placed him there so I can more accurately keep the water temp a bit warmer and I can know exactly what he is eating.He has been keeping one eye closed only opening it on rare occation .He sometimes seems to loose use of one side and lilts. I have no idea how to treat him other than what I have told you here. Tomorrow I will take him out into the sunshine for a bit, closely monitored of course We live in Tampa so plenty of Sun to bask in. If you have anything to offer in the way if helping my Little Dude please e-mail me. I know time is of the essence right now. I am afraid I will lose him if he doesn’t make a turn for the better but I simply do not know what to do for him Thank you.